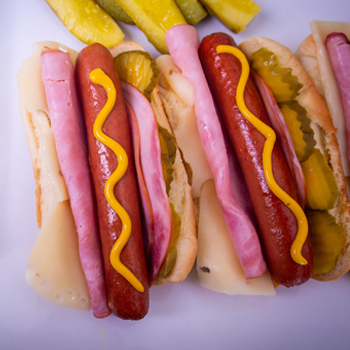 Cuban Hot Dog – Stahl-Meyer Foods, Inc.
Preheat your panini press to 425. If you don’t have a panini press, preheat two heavy skillets on the stove over medium heat. Slice baguette for sandwiches. Spread both sides of the baguette with mayonnaise. Then layer black forest ham, sliced pickles, hot dogs (pre grilled or not) cut into half lengthwise, and then swiss cheese onto one side. Top with drizzle of yellow mustard. Top sandwich with other side of bread. Using a brush, brush some butter onto the panini press and set sandwiches on the press. Brush the tops of the sandwiches with butter. Close panini press. Cook until the cheese has melted completely, the hot dogs are heated through, and the bread is golden brown. Serve immediately.